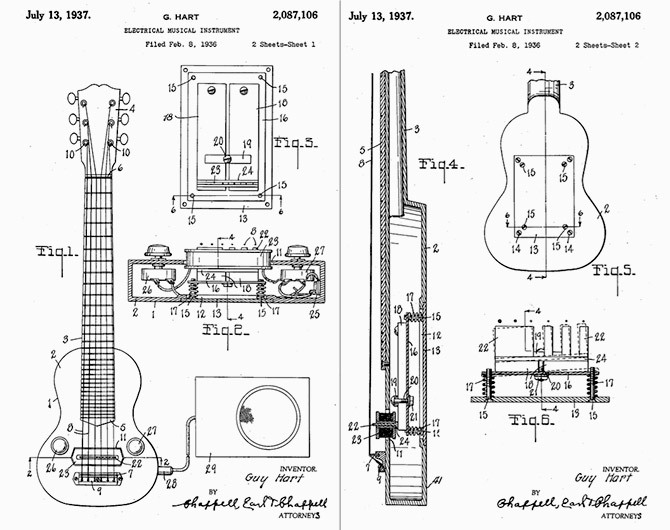 1937: Guy Hart, general manager of the Gibson guitar company, is awarded the first patent for an electric guitar pickup. The instrument that defines popular music in the second half of the 20th century is born. Gibson’s electric guitar wasn’t the first to market, but its pickup design was superior to competing models — especially after guitar-makers begin dropping them into their new, innovative designs more than a decade later. Guitarists have a reputation for coaxing as much volume as possible out of their instruments — whether it’s advisable or not. But guitarists playing in dance bands, larger combos and jazz orchestras in the early 1930s certainly needed the volume boost. They were often playing in situations where they were straining to be heard over the drums, brass and audience chatter. The newest, loudest design of the era was the resonator guitar. Usually made of metal, it had a series of aluminum resonators built into the body. 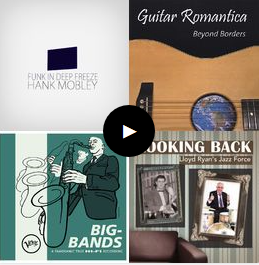 The resonators amplified the acoustic instrument and gave players an edge they couldn’t get out of the common acoustic guitar. But of course, the ax-slingers were always asking for more volume, so inventors of the day were constantly experimenting with crude electronic-amplification systems. The first viable electric guitar was designed by guitarist George Beauchamp, who began manufacturing them along with Swiss-born engineer Adolph Rickenbacker. The guitars made by Beauchamp and Rickenbacker were of the “lap steel” variety, which the player holds flat in the lap and slides a metal bar up and down the strings to play different notes. These guitars were nicknamed “frying pans” because of their small, circular bodies and long necks. Guitarists playing Hawaiian music, where the lap steel guitar is the lead instrument, began to flock to them. All guitar pickups employ essentially the same design: one or more magnets wrapped in a thin coil of wire. Beauchamp’s pickup used two horseshoe-shaped magnets situated over the strings, and he filed a patent for his particular design in 1934. Guy Hart saw the market for Hawaiian guitars growing and decided it was time that all-acoustic Gibson got in the game. Hart didn’t want to build any competing instruments using Beauchamp’s horseshoe pickup, so he began tinkering with a new design. By 1935, Hart and Gibson’s in-house engineers had developed a working prototype. Gibson’s pickup used a fat steel blade positioned vertically underneath the strings. The blade was then sandwiched by two heavy magnets at the bottom, and the wire was coiled around the blade, above the magnets. In late 1935, Gibson rolled out the E-150, its first electric, Hawaiian-style lap steel guitar. It came with an amplifier (just like all electric guitars of the era), and the whole package sold for $150 (more than $2,300 in today’s leaf). Unlike Rickenbacker’s “frying pan,” Gibson’s guitar actually looked like a guitar, complete with round feminine curves, shoulders and scooped waist. The first models were made of aluminum, but in early 1936, Gibson started building them out of the same wood as its acoustic instruments, making the E-150 look more like a traditional guitar. Soon thereafter, Gibson duplicated the success of the Hawaiian model by adapting one of its more common “Spanish style” guitars into an electric. I have designed the body of the instrument with a relatively thick wall of hard wood … which is substantially lacking in the quality of resonance. Aside from the sounds emanating from the amplifier designed to be employed in connection with my device, the only audible effect produced is that of vibrating strings themselves unamplified by a sounding box effect of the body of the instrument. What Hart described was not a traditional, hollow-bodied guitar getting a boost from a pickup, but rather a guitar that makes noise only when it’s plugged in. Hart’s patent was awarded July 13, 1937. Beauchamp’s patent, though filed two years earlier than Hart’s, wasn’t awarded until August 10, 1937. Curiously, Gibson continued to make a slew of hollow-body Spanish models fitted with pickups, like the ES-150. The model found its way into the hands of jazz pioneer Charlie Christian. The leap to solid-body guitar design didn’t happen until after World War II.Guitarist Les Paul fired the first shot in the modern guitar revolution in 1946 by crafting a crude axe out of a 4-by-4 piece of solid pine. He convinced Gibson the new design had promise, and the solid-body guitar bearing his name would go on to become one of the most famous instruments in the world. Just as Hart predicted, the future wasn’t in acoustic boxes that got louder with the help of his device. He knew the secret: If you really want to rock, you’ve got to plug in! Previous RW/RP Pick-up? what does it mean?